Ralph Peacock (1868-1946). The painter and illustrator Ralph Peacock was born in Wood Green, London on 14th August, 1868. He was trained as a civil servant but when he was 18 he took art classes at the South Lambeth Art School, attending twice a week in the evenings. John Pettie saw one of his portraits and was so impressed he recommended that Peacock should take up painting professionally. Following his advice, Peacock attended the St. John's Wood Art School where he stayed for a year and then in 1887 he was admitted to the Royal Academy Schools. Peacock would have been familiar with all the famous contemporary artists of the period such as Sir Frank Dicksee, Lord Leighton, Holman Hunt, Burne-Jones and Herbert Draper. 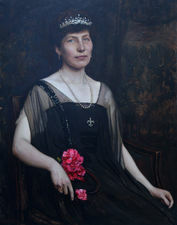 It was common practice for artists to exchange models and Mary Lloyd, a professional artist's model, sat for Leighton and Alma Tadema and was introduced to Peacock by Herbert Draper. Peacock painted her in 'A Study' of 1896. Peacock was also good friends with J.W. Godward. The influence of these artists on Peacock in his early years was very strong and he won a Gold Medal and travelling scholarship from the Royal Academy for his historical painting 'Victory'. This work, a highly classical subject showing a Gaul with supplicant woman pleading on behalf of a captured Roman, shows Peacock's undoubted skill in portraying the human form. He also won the Creswick prize. From 1890 Peacock also did book illustrations, signing his rather lively wash drawings with a flourishing signature or sometimes just 'R.P.' In 1892 he travelled around the Mediterranean and Switzerland. He exhibited his works winning medals in Vienna in 1898 and in Paris at the Exposition Universelle in 1900. By this time Peacock's main interest was portraiture and he made his career as a very successful portraitist. Holman Hunt was among his sitters but he specialised in elegant society portraits of ladies and children. A double portrait called 'The Sisters' is in the collection of the Tate and Peacock painted this in 1900. The elder of the two girls, Edith Brignall, became his wife and they lived with their two sons in Wimbledon. He eventually moved to Camden and died there on 17th January, 1946. Peacock exhibited many society portraits at the Royal Academy and elsewhere and this charming picture is a fine example of the artist's genre. While illustrations by Peacock are widely distributed in the magazines of the day, including Punch, paintings by him are hard to find other than in public collections. Exhibited: Royal Academy, Royal Society of British Artists, Grosvenor Gallery.